Cats know they're beautiful but their reaction to a cat reflection in the mirror varies widely. Some cats completely ignore the reflected kitty while others are curious, possibly wondering why this other feline doesn't have a unique scent. Still, other cats may exhibit aggressive or fearful behavior when they see their reflection. If your cat is showing a negative reaction, there are ways you can help. Quite often, the key to helping a cat overcome a negative behavior to a stimulus is exploring the possible causes of their reaction. In the case of mirrors and reflections, there are a number of reasons a cat may act out, hide from the "intruder," or become genuinely terrified. One of the most common is found in young cats who have never seen a mirror. Kittens who have lived their entire life in an animal shelter may not have been exposed to common household things like mirrors, carpet, or TVs and radios. When they are adopted and brought into a home, each of these things can bring on a fear of the unknown. Other cats may be familiar with their reflection, then react when seeing another cat in a mirror. For instance, your kitten may be used to seeing its own reflection and associate that with a "happy" cat. Then, if you have another cat visit, your kitten can smell the new cat but not the cat's reflection. The absence of a distinct scent for this fourth cat can really throw a kitten off and invoke a reaction of stranger danger. Another scenario involves a cat associating a reflection in a glass window with danger outside that window, such as a stray cat who wanders into your yard. A cat who is naturally scared or aggressive may come to associate this shiny surface of a mirror with the negative experience. They may also come to associate this hostility to their own reflection and become suspicious of that intruder, even if it was previously accepted. Cats will react to reflections in various ways. It's good to observe your cat for a little bit to determine if it is displaying fearful or aggressive tendencies. For many cats, it's just a passing phase, part of growing up and experiencing their new world. Quite often, cats attempt to find the other cat by pawing underneath or at the side of the mirror to "get around" the barrier preventing contact. It's similar to what many cats do when they see TV images of birds or other critters, mistaking the screen for a window. A mirror-gazing kitty who cannot find the source may become suspicious so its fearful reflection also triggers defensive body language. Then, seeing its own aggressive/fearful/defensive language in the reflection makes it think that cat-in-the-mirror means business, so it reacts accordingly. Many cats eventually figure out that the reflected cat is not a danger, but others do not. They may take it to the level of attacking the mirror in an attempt to ward off this intruder. The behavior may intensify and possibly become an obsession if it's not addressed. In these cases, you may need to remove all reflective surfaces that are at your cat's level. In the least, you can tape paper or hang a cloth over mirrors so your cat can no longer see its reflection and gets to practice the aggressive behavior. If you have observed that stray cats in the neighborhood are amping up your cat's reactivity to windows and mirrors, you will want to shoo them away. While you employ various tactics to keep cats out of your yard, keep the curtains closed so your cat does not see them. Once you've been successful in your deterrents, you can slowly go back to normal, open the curtains, and your cat may become more receptive to reflections again. After some time of taking these preventative steps, you may be able to slowly reintroduce your cat to mirrors. 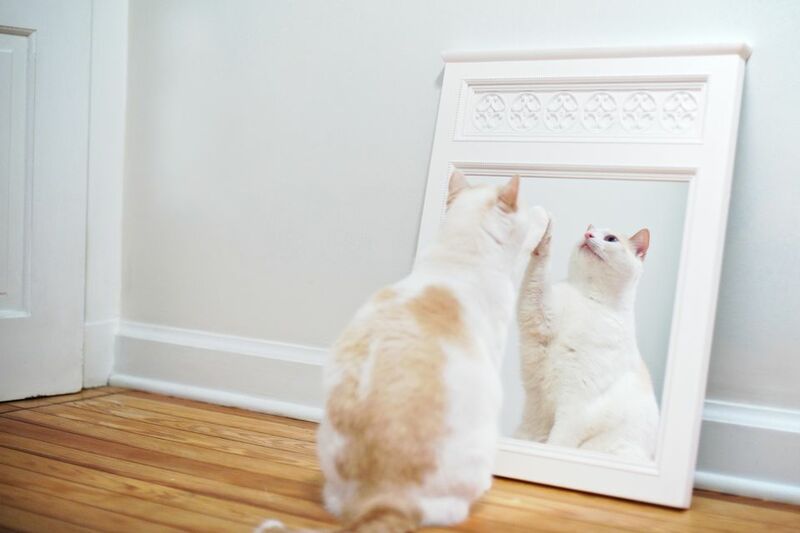 When doing so, be sure the mirror is associated with positive experiences such as toys, treats, or catnip. Lure your cat in front of an exposed mirror with their favorite item and let them enjoy it. They may be distracted enough to ignore the reflection or notice that the reflection is also very happy and is not a threat. In time and with more experience, most cats can put mirror-angst behind them. If your cat continues to have anxiety around mirrors, you may need some extra help. Pheromone products like Comfort Zone with Feliway can help calm upset feelings. You can spray this around the mirror or use a diffuser to spread the scent throughout the room.